It's been years since I've made pineapple fried rice. It used to be one of my go-to dishes. Hubby remembers me making it all the time, and in my heyday of cooking, I would be really extra and serve the fried rice in the hollowed out pineapple shell. I decided to recreate the dish today and used this recipe as the base--as per usual, I made a bunch of substitutions including omitting the shrimp, cashews, and coriander. I also added scrambled eggs and a bunch of other seasonings. 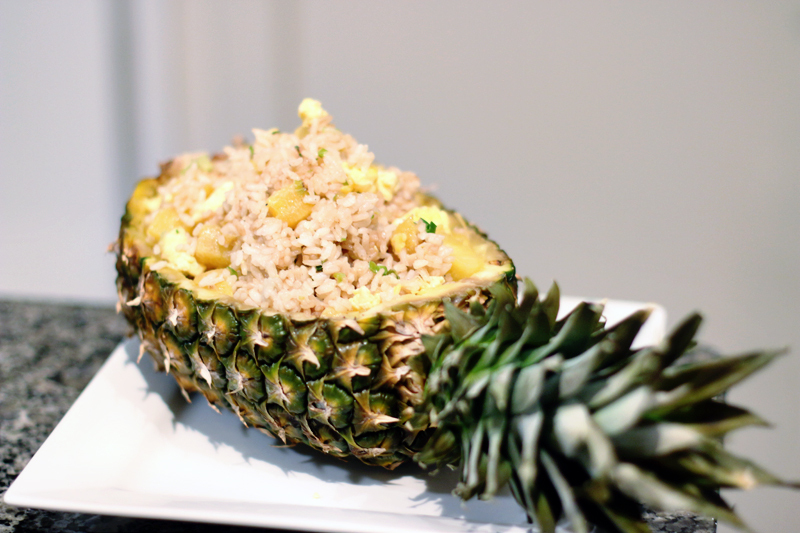 I presented the fried rice in the pineapple shell, just to see if I could still remember how to do it, and it turned out so well! It was surprisingly fun to make this dish, and the result was delicious--the pungency of the shrimp paste and fish sauce really came though. The pineapple shell was literally just for this blog post though. I put all the rice back in the wok right after taking this photo (and a video clip). We had to heat up the rice anyway, because I had made it earlier in the afternoon, before I totally fell off the rails trying to frost some shortbread sandwich cookies. Hubby came home to find me covered in cookie crumbs and icing--and not in a good way. If you want to see some delicious tasting but terrible looking cookies, you'll have to tune into my vlog tomorrow. Back to the fried rice. I feel kinda silly for going so many years without making this delicious dish. In an attempt to make up for lost time, I'm going to cook this again tomorrow, minus the pineapple shell.